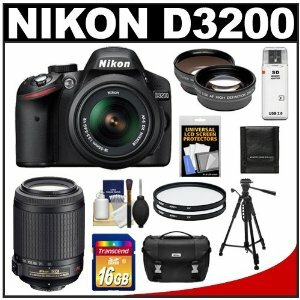 I purchased a Nikon DSLR D3200 for my birthday. 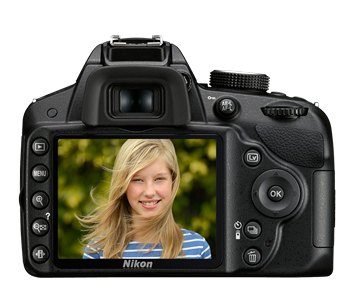 I chose the Nikon because my experience with SLR cameras is also with Nikon/Nikormat cameras. I loved my SLR, so I went with Nikon again. I know that taking great photos isn't just about the quality of the camera. My dad has a Sony camera. I am not sure which one, but he definitely spent more money than me. When we started comparing the features, I was getting jealous. He has this great feature that tells you what settings (ISO, shutter speed and aperture) were used when the picture was taken. Maybe my camera can do this and I just don't know how yet? We went out shooting together. He made me jealous again with his LCD screen which pulls away from the camera and tilts. He showed it off while taking macro shots of mushrooms that were fabulous! I had trouble getting close to the mushroom and being able to see what I was taking a picture of. The difference between us, though, is I have a better understanding of photography mechanics and plan on continuing to learn. He just shoots in the pre-programmed settings. He used his camera on auto, landscape, macro or the P setting the entire time. He later showed me some of his favorite photographs he's taken and I kept thinking, this picture would have been more interesting if he had used a wider/narrower aperture or a shorter/longer exposure time. Granted, when we went out, I didn't know how to use my camera hardly at all either. I didn't know how to manually focus it or to really use M mode. When I put the camera on M mode, I understood how to change the shutter, but not the aperture. I did start figuring these things out though after a couple of days of handling the new camera. While we were out, I practiced with depth of field using the aperture priority mode. It was fun taking pictures of objects and practicing making the background fuzzy or sharp. I have taken photography classes and I am now reading, reading and reading what photography bloggers are putting out there. So my lesson to you is this: learn how to use your camera and study photography theory. If you just go around pointing and shooting, your new fancy camera will just be another point and shoot - or worse! 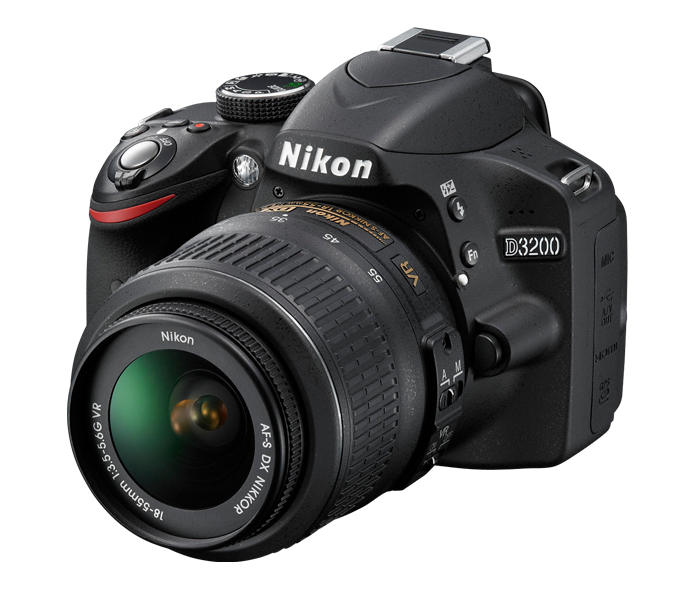 For more information, check out the Nikon's official page for the Nikon D3200. I was excited over the idea of using the Wi-Fi connectivity for sending pictures to my phone, using my phone as an external LCD screen (for macro shots!) and as a remote control. The reviews, however, made me decide not to purchase the Wi-Fi dongle. If the app gets heavily updated and the dongle gets smaller, I might reconsider. What impressed me with this kit over other kits is that the telephoto lens is also a Nikon brand lens. I was also thrilled to grab up all the other goodies. Transcend 16GB SecureDigital Class 10 (SDHC) Card: Your new camera does NOT come with an SD card, so receiving this goody in a kit was most welcome. It is a good size for taking normal to fine jpegs. If you want to shoot in the RAW, jpeg+RAW or HD video, you will need to invest in a larger SD card. The Class 10 Transcend cards perform well speed wise and are relatively inexpensive compared to some of the more well-known brand name cards. I am thinking about grabbing a 32 or 64 GB Transcend card in the near future. When purchasing an SD card, you should get Class 10 or higher for HD video recording and faster transfers. Nikon Deluxe Digital SLR Camera Case: I like to store all my gear in a camera bag. I sometimes will carry it with me, depending on where I am going. For instance, my first weekend shooting I took the bag with me to the park to take pictures. I have always been a little wary of doing street photography with a camera bag. They just look like a great target for a purse snatcher. What I have done in the past is constructed inserts out of cushion foam and put them in a purse/messenger bag that crosses over the shoulder. Just makes for a slightly less interesting target, plus I find it more comfortable in general. Vivitar 52mm UV Glass Filter: Always, always, always use a UV Filter on your lenses! The filter is clear, but actually helps reduce glare. The biggest thing it does is helps protect your lens. It prevents dust, scratches and smudges on your expensive to replace lens. Also, when you drop your camera, the filter is designed to break first. I remember dropping my brothers camera roughly a foot off the ground. It was in my homemade camera bag, but when I looked through the viewfinder I saw a large crack. I was 14 and I think I broke down and cried when I thought I had broken my brothers fancy SLR. I took it to a camera store and they chuckled and said everything was fine. They unscrewed the filter and replaced it. A new filter costs as low as $4 up to $20. Compare this to a new lens which would be $200 and up. So do yourself a favor and put an UV Filter on all of your lenses! PD-57TR Photo/Video 57" Tripod with Case: This tripod isn't the highest quality, but I was pleased with it. It is light weight and has bubble levels! Bubble levels are great since the vast majority of your pictures should be level with the horizon. The bubble levels give you a great reference for ensuring this. The case is similar to a yoga mat case. I will definitely use this tripod when shooting food and jewelry photography. I am also interested in trying some night photography with long exposures. PD USB 2.0 SecureDigital (SDHC) Card Reader: This card reader normally sells for $5 on Amazon, but it wasn't what I receieved. I received a Zeikos SD/MMC High Speed card reader, which is NOT what was advertised or pictured. I found this card reader on sale for $0.79. Let's just say these card readers are cheap! So should I have been surprised that the Zeikos reader died in the first attempt to use it? This really frustrated me at first, because I thought I wouldn't be able to use my camera with my Chromebook, which wouldn't mount the camera with the USB cord. After a week of owning the camera, I found my built in SD card reader on the Chromebook. Whew! Crisis averted! LCD Monitor Screen Protectors: What I have found is the LCD Monitor Screen Protectors are crappy. They don't go on like my phone screen protectors at all! I had the fiance put them on, as he is pro with screen protectors since he is an Android enthusiast and gets a new phone every 3 months. He grumbled the whole time and said he was never going to try those again. What I got was a bubbly mess. My suggestion, don't even bother trying to put these screen protectors on. I am thinking about buying a screen protector for the Note 2 (large screen) and cutting it down to size. You have to cut down the screen protector in the kit any ways. Would I Recommend this Kit again? I am very satisfied with my purchase and would definitely recommend this kit. I think even with the cheap card reader and screen protectors, the kit overall is worth it for the extra lenses, filters, SD card, cleaning kit, tripod and case. You just need to purchase it knowing there are a couple items not even worth bothering over. Click to enlarge or head over to my Google+ album. Are you an amateur photographer? Are you working towards better photography skills? What do you like to take photos of? Want to share some of your photography? Or share some tips and tricks? Share with us at the Photog Show and Tell Link Party! 365 Project - A community for photographers doing the 365 challenge to take a picture a day. I am so jealous!! We're seriously considering buying a DSLR soon, and I'm so excited/nervous. I am a total beginner, so I will have lots of studying to do! Thanks for sharing about your camera! I'm just dreaming of the day I can buy a dslr - I know I'll be looking for a package deal, so this was really helpful. And your photos are great! Thank you! I had been dreaming for years. I am so happy I finally did it! Whoah! You captured some amazing shots. The proof is in the puddin' my friend, I think you have invested in a great camera here. (My faves were the green moss on the log and the stem of thorns among the orange and yellow plants. Striking colors. And crisp images.) I can tell this is going to just amp up your creativity AND your posts to a whole new level. And if I ever need to buy a new DSLR, I'll be sure to refer to this post for wisdom. Thanks, girlfriend. Woo-Hoo to the girl with a new camera :-).. Great shots and your Dad and I are similar.. our cameras have the flip put display.. It sort of is dummy proof for a novice like me!! Great write up on the Nikon!! Great post! I'm looking into a DSLR and trying to figure out what is most important to start with... yikes! I'm in over my head. I'm considering a Canon EOS Rebel and looking at the 13 vs 14. But maybe I don't need all that at first? Are lenses more imporant? I AM in over my head. LOL! I don't know the difference between the two, but for amateur photographers like us, I'm not sure there is enough of a difference when you compare last years model to this years. Sometimes the changes between models can be huge, but other times it is going to be slight changes. I don't think cameras have made any huge leaps and bounds the way cell phones currently are. Cameras have been around since the early 1800's and the optics on your DSLR aren't that different from an old SLR. Again, though, I'm not an expert. I would start by Googling "Canon EOS t3 vs t4" and see what the professional reviewers have to say. I did this and the first article talks about how it might be best to get the cheaper model and save your money for another lens or memory card or just save it (http://www.cameradebate.com/2012/canon-rebel-t3i-eos-600d-vs-t3-1100d-vs-t4i-650d/). Skimming through the article, it sound like the t3 and t3i are some of the most popular cameras on Amazon. It also looks like the t4 is probably preferred if you are interested in also using it as a video camera. I've read some articles that talk about upgrading your camera and they suggest upgrading lenses over cameras. From this, I would say yes to your question. Lenses are more important. The lens(es) that come with your camera are called "kit lenses" and are the lower end lens. This doesn't mean that you can't take great shots as an amateur photographer though! You camera most definitely will tell you what settings were used when the image was taken. It is collected in the EXIF data. You can see that when you load your images into an editing program like Lightroom. You have a wonderful camera there and it will take you far! Looks like you are off to a wonderful start. Thank you! I'm so glad that you think its a good camera! I just naturally gravitated to Nikon since I own a Nikormat SLR and have worked with a Nikon SLR. 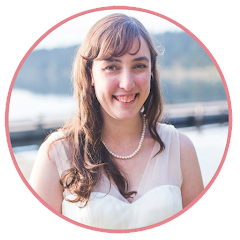 It is wonderful getting to meet up with other photographers and learn from each other! I will have to look into seeing that data. I am relieved that it is there. I was very jealous of my dad's camera, because it displayed it in the "Play" menu. Thank you for participating in our party! These is the best camera!!! There's always a bit of learning with new cameras.